Your young daughter will travel in style when the family sets off on that weekend away. She can pack everything she needs into this ultra-cool personalized polka dot backpack and show it off as you head for the plane. It is fresh and fun in warm pink and white polka dots with an aqua trim for added effect. The bag offers two zip compartments plus extra side pockets for mobile phones, water bottles, and other small necessities. Each compartment is separately accessed via a double zipper. The bag can be picked up using the grab-and-go handle on the top or can be comfortably carried on her back using the padded shoulder back straps. 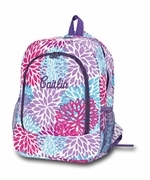 Add the matching lunch tote item MS-22122. I gave this bag to my granddaughter for a back to school gift. She said her friends all complimented her on how cute her backpack is. She was very grateful!